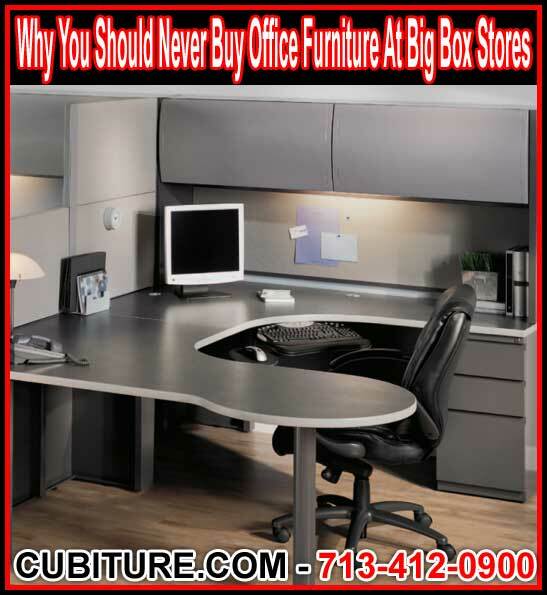 Why You Should Never buy Office Furniture From Big Box Stores! Big box stores seem to have all kinds of office furniture for sale these days. Many smaller businesses are tempted by these sales, believing that they can start their companies for pennies on the dollar. In reality, it is never wise to buy anything that is going to cost more money in the long run. Even for startups on Spartan budgets, big box stores offer little-if any—return on investment. Many advertise ergonomic options that are less than what they seem. Many more offer limited warranties on office furniture for sale because the quality of these items is often exactly what you pay for. Most office chairs sold in big box stores are not as ergonomic as the retailer claims. Whenever big box stores advertise office furniture for sale, they invariably showcase ergonomic chairs that supposedly offer greater support for the human back. The sad reality is, however, that a large majority of these chairs are not rated for an 8-hour workday. This means that according to the engineers who designed these chairs, a worker can only sit in one comfortably for 5 hours. If you look closely at the specs on these chairs, you will also find that they offer only limited adjust ability. You may be able to adjust the chair height, but other adjustments, such as setting the right height for armrests, or setting the optimal tilt for the backrest, simply cannot be done with these models. Warranties are not as good for big box sale items. One of the reasons that you can find such cheap office furniture for sale in big box stores is because the store is in the process of liquidating the sale items. In many cases, the models on sale have recently been discontinued by the manufacturer. It is not uncommon for these lines to carry only a limited warranty, to begin with. When you consider that should you ever need a replacement unit, the chances of finding one in stock are going to be slim to none. Also, most items that are discontinued have been manufactured with components that have likewise been discontinued or re-engineered. Even a minor repair under warranty may be impossible, making it necessary to buy an entirely new and different piece of furniture at full price. Quality is often exactly what you pay for. When you see office furniture for sale under a recognized name brand, do not assume it is top quality. Almost every office furniture manufacturer makes lower end, midrange, and high-end furniture lines. While it is not unheard of for a major manufacturer to showcase some of their best products in a retail store, more often than not it is the lower end office furnishings that are being sold at discount prices in big box stores. If you want higher quality products by a certain manufacturer, it may only be possible to get them from an office furniture dealer like Cubiture.com. Cubiture guarantees quality at any price point. Jerry Mogyorody has always been a customer-centric office furniture sales and design specialist. His philosophy is twofold and simple: Ensure refurbished product quality with parts and labor warranty for at least 1 year, and always recommend new office furniture for sale with the very best manufacturer warranties that will protect an organization’s investment for well over a decade, and, in some cases, for the life of the product. Call Jerry now for the latest office furniture sale prices.